There is more information available on this subject at Black market on the English Wikipedia. A Kig-Yar black market hosted on Ven III. Eric Santiago: "How do you think Innies get UNSC explosives or weapons? Spare parts?" Eric Santiago: "Black market still has to get that stuff from somewhere." The black market refers to illegal trade outside the official economy. Both humans and several Covenant species are known to engage in black market activities. Black market bazaars are locations where illegal products can be handled on the black market by either pirates or Insurrectionists, who frequently attend these bazaars. Remote scanning outposts were intended to keep black market runners out of human space, as well as to watch for pirates and Covenant forces. Around 2494, Levosia colonists were suspected of diverting elements used to manufacture Shaw-Fujikawa Translight Engines to the black market. As a result, the United Nations Space Command's regional CENTCOM had the UNSC Navy blockade the planet's system, eventually leading to the Callisto Incident. 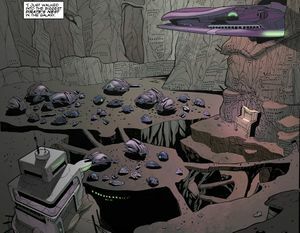 A black market bazaar was spotted in November of 2525 near the Roosevelt military base, which was taken down by Spartan-II Blue Team. During the Human-Covenant War, Insurrectionists modified Covenant weaponry for human uses and sold them on the black market. Before the Cole Protocol was established, the black market was flooded with Covenant weapons and equipment. Some UNSC Marines would occasionally return with Covenant weaponry from a battle to sell on a black market. By early 2525, the HMG-38 machine gun was considered obsolete by the UNSC, but was popular on the black market trade amongst Insurrectionists—particularly the United Rebel Front. Following the Human-Covenant War the black market was inundated with small arms, including the MA5C assault rifle. Directly following the war, weapons and ships were commonplace on the market, including B-65 Shortswords. Huragok "slaves" would often be sold on the black market by pirates and were considered very valuable. Among the Covenant, the Kig-Yar were known to sell goods on the black market, including Forerunner relics, outside the Ministry of Tranquility's authority. A massive black market was hosted by Kig-Yar pirates and smugglers below the surface of the desolate planet Ven III. During their service in the Covenant, numerous Unggoy participated in an active black market trade. Due to their interest in human culture, human transmissions—such as soap operas and sitcoms—were popular on these markets among Unggoy. Before the human-Forerunner wars, black markets existed throughout the galaxy. When prehistoric humanity discovered that an unidentified powder, found on the outskirts of the galaxy, made Pheru, animals domesticated by humanity, have a more favorable behavior. Due to this behavioral alteration, the powder began to circulate on black markets across humanity's interstellar empire.